Note: If you don’t have ready made tomato puree, grind 2 big tomatoes to make puree. Note: Yogurt/curds should be thick & should not contain water. In a mixing bowl add all marinate ingredients mix well. 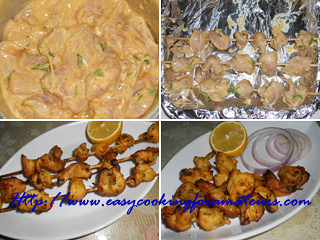 Into a skewer put chicken pieces. There should be a gap between each piece. Cover the baking tray with double layer of aluminum foil to avoid the tray from oil stains. Preheat the oven for 10min at maximum temperature. After 15 min remove the tray, turn the chicken to other side & brush some oil on top. Put it back to oven near to top coil. Let it cook for another 15 min or till it gets brown spots & dry. Remove it to the plate & set aside. At this stage this can also be served as chicken tikka. Note: Cooking time may vary from oven to oven, so keep looking in middle to avoid over cooking. Crush or powder cashew nuts & set aside. Add onion & 1/4 tsp salt, sauté till golden brown. Add turmeric, ginger paste, garlic paste, chilly powder, coriander powder, cashew nut powder & 2tsp water, mix once. Cook till raw smell goes. Keep stirring in between. Add water if required to adjust gravy consistency. Add chicken tikka & cream, Mix well. Adjust seasoning & turn of the heat. 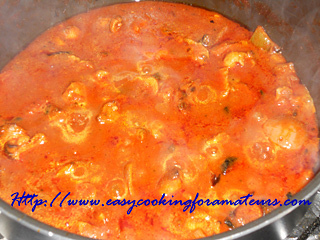 Chicken tikka masala is ready to serve with naan, chapati or roti. lovely colour of the gravy and rich chicken masala,looks tempting!! 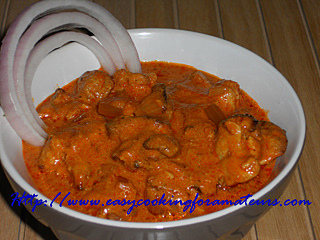 Slurp, mouthwatering here, delicious and irresistible chicken tikka masala..
chicken tikka masala looks awesome delicious. hmmm delicious and tempting masala. Wow! It looks so appetizing! I just can't help drooling! Looks awesome..makes me hungry..tempting clicks dear. this chicken tikka masala looks extremely tasty. Very different from the usual ones, looks mouthwatering!